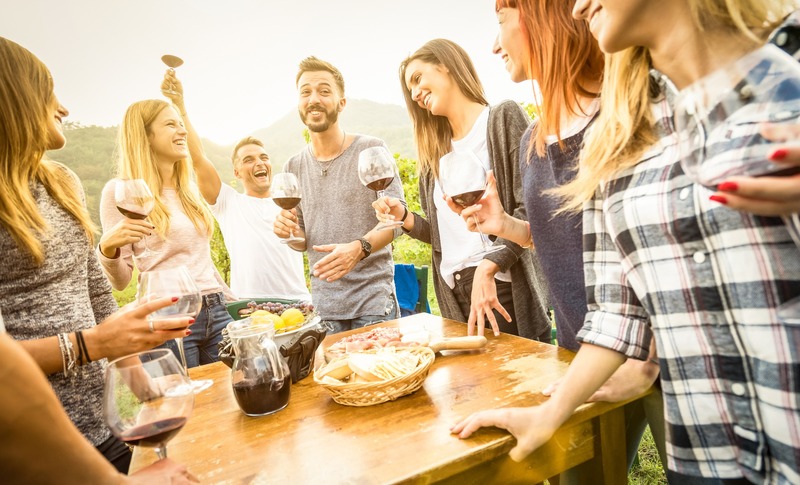 Hosting a backyard wine tasting party is about more than simply trying and comparing a handful of wines; it is about bringing together a small group of friends for conversation and a shared, memorable experience. To help you plan a successful wine tasting party that your guests are sure to remember, we have put together this complete guide to hosting tasting parties. Before we get into wine pairings, party favors and themes, here are a few general tips and things to consider while planning your tasting party. 1. 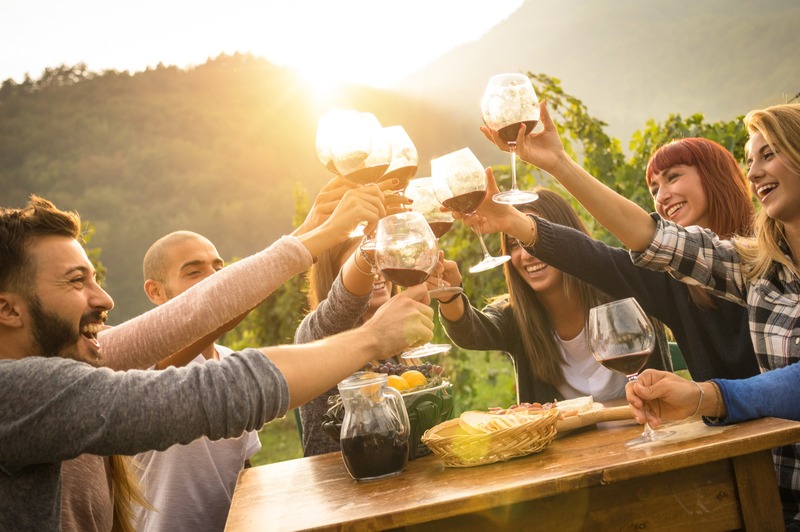 Backyard wine tasting parties should encourage group involvement and conversation, so be sure to arrange seating to encourage this. 2. Before planning your menu, you will need to decide if you want to host a dinner party along with your wine tasting or simply pair your wines with small bites. 3. Well before your party takes place, you will need to have a plan and schedule to ensure all of the wines are properly served in regards to temperature and aeration. This infographic from Wine Folly can help. 4. Before picking a theme or sending out invitations, decide how formal or casual you want your tasting party to be. This will dictate most of the party planning aspects discussed below, so this is important to decide early in the planning process. 5. Wine tasting parties are most successful with a short guest list. This keeps the gathering more intimate, keeps the group together and allows your guests to more easily discuss the wines they are tasting. 6. It is best to serve the lightest wines first and work you way up to the heaviest, so plan your tasting and pairings accordingly. 7. It is helpful to know how experienced and knowledgeable your guests are when it comes to wine. This will help you determine appropriate party games, whether or not you want to use score cards or keep things more casual, or if it might be fun to hire someone to give a short class on how to taste wine and how to pair wines with different foods. Alternatively, you can watch a few videos online and teach your guests the basics of wine tasting before you begin. 8. No one should be driving after an afternoon or evening of wine tasting, so plan for transportation ahead of time. This could simply be getting the apps for Uber and Lyft to arrange rides home, designating drivers, or hiring a shuttle to take guests home after the party. Sending proper party invitations is quickly becoming a lost art, since it seems that many people have forgotten the importance invitations play in planning and hosting any social gathering. The invitation is your guests’ first impression of your party, lets them know what to expect and allows them to prepare for the event. Your invitations should reflect the theme, colors and level of sophistication so that your guests can plan accordingly. For example, it should be easy to determine if your event will be casual, semi-formal or formal based solely on the style and wording of your invitations. Letting your guests know what to expect makes them feel more comfortable, which is part of your job as the party host. It allows them to confidently choose their attire and gives them clues about other helpful information, such as if they should eat beforehand or if you will be serving food. For easy party planning, simply match your theme to the wines you will be serving. For example, if you are serving wines from Napa Valley, you can go with a Napa theme, which includes almost any décor that has anything to do with wines or vineyards. This might include decorating with faux grapes and vines, wine cork art or old wine barrels. All of this décor also works if you simply want to have a general wine theme for your tasting party. If you are serving wines from Spain, choose Spanish-themed décor, serve tapas and fill your playlist with classical Spanish guitar. Folks living in San Diego County, Orange County, Riverside County or nearby areas have lots of options for serving local wines, which is a fantastic way to get to know local wines and to support local vineyards and vineyard workers. So, you could choose to serve local wines and choose your theme accordingly. For example, if you will be tasting wines from Fallbrook, your décor can blend the rustic, country atmosphere and the thriving art scene for which Fallbrook is known. Once you pick a theme, make sure you create an appropriate playlist to have playing low as background music to enhance the ambiance without impeding conversation. The theme of your party will dictate the décor, but since this is a wine tasting party, there is some décor that is always appropriate. For example, you could make simple centerpieces by filling vases with wine corks, make small slits in corks to transform them into place card holders, or use corks to create trivets or artwork to decorate your outdoor entertaining areas. Another tip to keep in mind while planning your décor for a seated wine tasting is to keep your centerpieces low so that they do not block the view of other guests or inhibit conversation. What you need to host a wine tasting party will depend on the type of party you are having. You will need wine glasses, of course, and you do have to have real, glass wine glasses. You cannot host a tasting with plastic glasses or regular glasses that are not intended for wine. If possible, have the right type of wine glass for each varietal you will be serving. 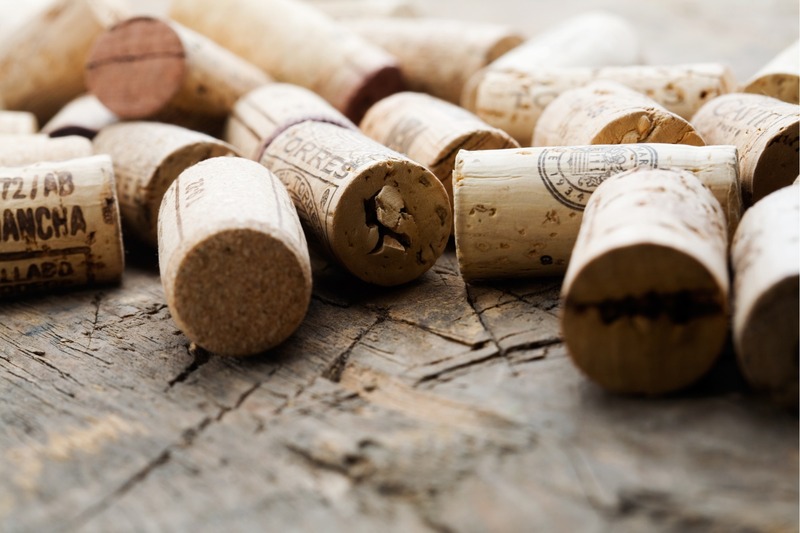 If you plan on reusing the same glasses for each new wine, you will need to rinse them out and dry them completely so that there is no remaining water to influence the experience of the next wine poured in the glass. If you are not reusing glasses, you will need to make sure you have enough wine glasses on hand for each guest to have a new glass with each wine. For more formal tastings, it is often expected that each wine will have its own glass. For a more casual gathering of friends, it is okay to reuse the same white wine glass for all of the whites and the same red wine glass for all of the reds. For a more formal tasting, you will also need tasting notepads or score sheets for each of your guests, and you may want to have at least one or two tasting tip sheets available for your guests to peruse. You can make all of this very simple by purchasing a wine tasting party kit online where you will find kits with everything you need from scorecards to aroma wheels. Backyard tastings usually involve more sipping than spitting, but your more experienced wine tasters may expect to see a bucket on the table. Even if you do not plan on anything as formal as spitting going on, a bucket is a good idea to have on hand so that your guests have a place to pour out wines that do not suit their taste buds and will not be finished. You will also need table linens, including tablecloths and napkins, small plates, utensils, servingware, and enough chairs for all of your guests. All of these items can be purchased, if you are a frequent party host, or rented so that you do not have to store them or worry about washing tablecloths or doing dishes after your party. Unless you are hosting a dinner party along with your wine tasting, it is perfectly appropriate for your spread to be made up of small bites to be enjoyed with or in between rounds of wine tasting. You will want to include palate cleansers, such as breads, as well as foods that pair with the wines you are serving. 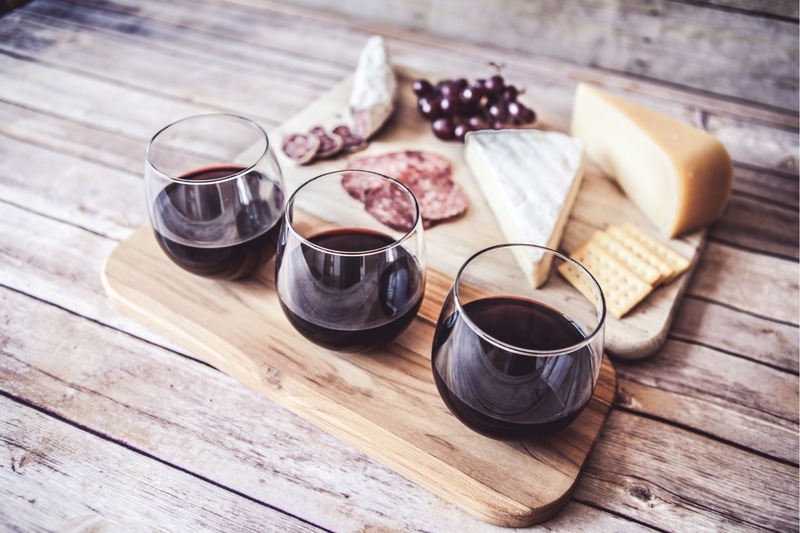 Some examples recommended by Williams Sonoma include pairing cabernet sauvignon with sausages and hard cheeses, pairing pinot grigio with goat cheeses or green vegetables, pairing Riesling with citrus or charcuterie, and pairing dessert wines with nuts, chocolate or dried fruit. Since wine is at the center of this social gathering, you will need plenty of it. Typically, backyard wine tastings include four to six wines that include both reds and whites to accommodate guests that may only drink one or the other. In most cases, one bottle of each wine for every five or six guests is appropriate for the tasting portion of the evening. You will then also want to have at least one more bottle of each wine on hand for every five or six guests so that they can continue to enjoy their favorite wine throughout the evening. Wine is, obviously, going to be the beverage of choice throughout your gathering, but you will want to make sure you have a couple of other options as well. For example, you will want to have either bottled water or a beverage dispenser with water so that your guests can take a break from the wine, when desired. It is also good to have a festive or theme-related, non-alcoholic beverage available for those who want to keep an eye on their wine consumption or who have had enough alcohol for the evening and should stick to virgin drinks until a sober guest drives them home at the end of the night. Non-alcoholic sangria is a good choice for this at wine tasting parties. 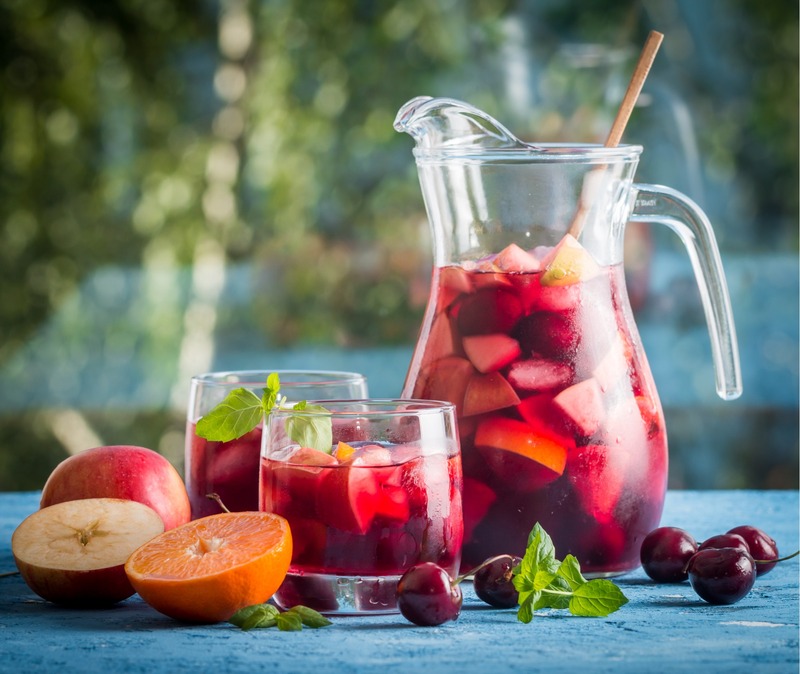 Since sangria is traditionally made with wine, it allows your guests to stay in the spirit of the gathering without the alcohol content. Try this recipe from kitchn that uses black tea and pomegranate juice to more closely approximate the experience of drinking red wine. Having a fun, non-alcoholic option will also help ensure that you are including all of your guests and making them feel more comfortable. 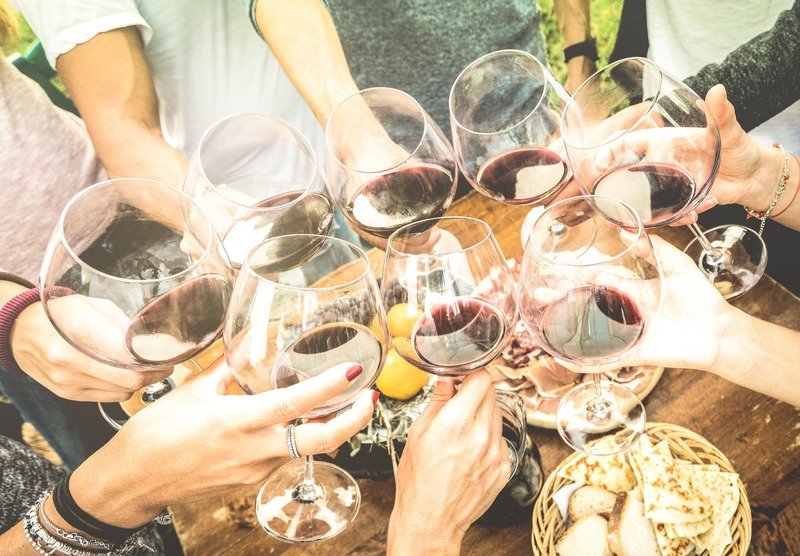 While it seems obvious that your guest list would include wine drinkers, if you are inviting couples, one partner might be a wine drinker while the other is sober or a teetotaler. Not all wine tasting parties have party games, since some are rather serious affairs with official score cards and sommelier-level discussions. However, mixing in one or two wine-themed party games is a great choice for more casual gatherings. If your guests are relatively experienced wine tasters, you could have them taste wines and have to guess the correct region or varietal to win a prize. Another option for more knowledgeable wine drinkers is to play a wine trivia game. If your guest list is made up of folks who enjoy a glass of wine but could not necessarily tell the difference between a Syrah and a Sangiovese, it might be more fun to play games that require little to no knowledge of wine. For example, you could have all of your guests try the same wine, and then draw a label or write a tagline for the wine. Then all of your guests can vote for the best label or tagline for that guest to win a prize. 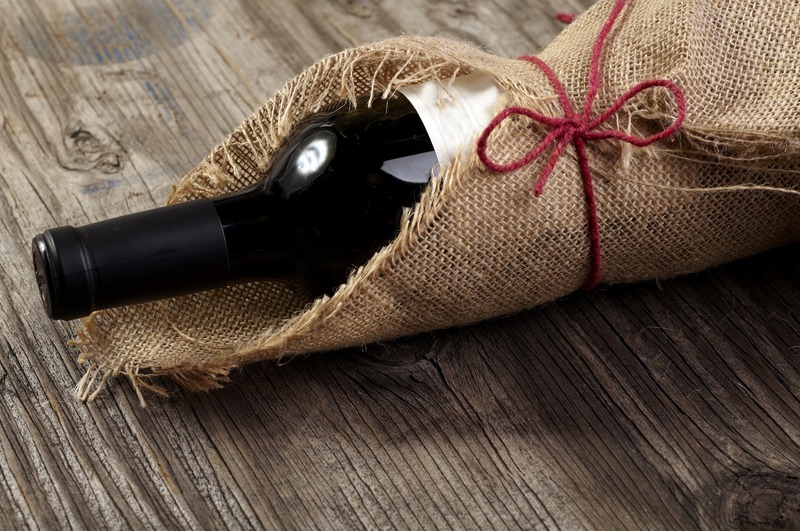 Another easy game your guests are sure to enjoy is a blind taste test pairing a low-cost wine with a higher-cost wine. For example, pair a higher-end Shiraz from California with a Charles Shaw Shiraz (affectionately known as Two Buck Chuck, made mostly from California grapes and available at Trader Joe’s) to see if they can determine which is the bargain wine and which is the expensive wine. The winners of your party games should, of course, win prizes. These should be somehow related to your party theme, so you might choose bottles of wine, wine-themed gifts, wine glasses, a gift basket or something that goes with the party favors each guest will receive. Parties are always more memorable and fun when there are party favors involved. For a wine tasting, this could include bottles of wine, wine glass markers, engraved wine glasses, a small cutting board and cheese knife, a wine aerator and pourer, or a personalized corkscrew. For smaller parties, you might also consider small, wine-themed gift baskets for each guest to take home.